The Green Living Show, the largest green consumer show in North America, is back in Toronto for its sixth year. I checked out the show for the first time in a few years Friday evening, and was pleasantly surprised by the variety of vendors, activities, information, and interactive booths; and of course, by all the delectable food samples just waiting to be tasted. With over 400 exhibitors showing off their latest and greatest green products, services, and fare — everything from organic wines to natural beauty products to innovative green technology and the chance to test drive an electric car — it can be overwhelming to decide where to start, what's worth seeing, and what's worth skipping, so I've narrowed it down to my top five picks from the show. By far the coolest thing I found at the show, the YikeBike is a super light, folding, electric bike that requires a heck of a lot of core balance to drive without falling over. After watching a few other people drive — or attempt to drive — the Yike, which reaches a top speed of 25 kilometres per hour, I decided to give it a whirl. "Know what the trick is?" the older gentleman who had just finished his turn asked as he handed me the helmet, "Just look ahead, don't look down." Advice or no advice, the Yike is a lot harder to maneuver than it looks... but, like anything, with a bit of practice some people seemed to be able to get the hang of it. I was not one of them — maybe next year. Located right inside the entrance to the show, it's hard to miss this beautiful booth with an array of flowers, plants, and decorations sprawling the table. 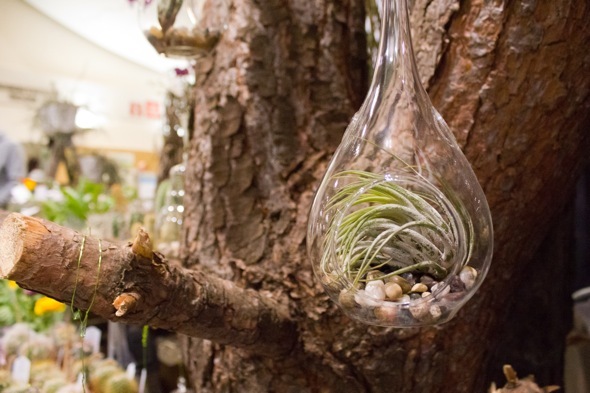 I instantly fell in love with many of the pretty flowers and arrangements, but what really caught my eye was the air plants, which are native to the rainforest and do their best in dark, humid rooms — like your bathroom. Easy to care for (rinse it twice a week) and hearty enough to be displayed anywhere (in a jar, sitting on your counter, hanging from the ceiling), these little guys were just too good to pass up, especially given my lack of a green thumb. While the farm fresh fare is always a hit at this show — tasting tickets can be bought for $2 a piece — one of my favourite things at any kind of consumer show is trying the various food items available. 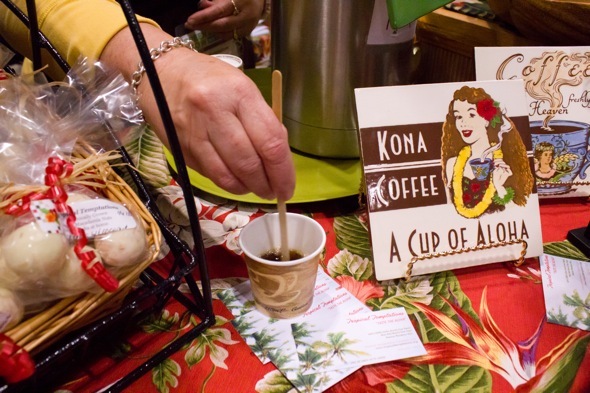 The Green Living Show is no exception, offering a ton of organic, healthy, and unique options to tantalize palates. From cracking open a whole coconut and enjoying it's milk, to sampling locally made jams, cheeses, and meats, to dairy-free ice cream and cheese, you're almost guaranteed to find something you'll enjoy — and, in my case, take home. Be sure to swing by the Cookstown Greens booth to check out their edible flowers while there - it was a little weird munching on a purple flower, but how do you not try something like that? This isn't the first I've heard of Swapsity, but it is the first I've heard of their face-to-face Toronto swaps, which happen sporadically throughout the year. 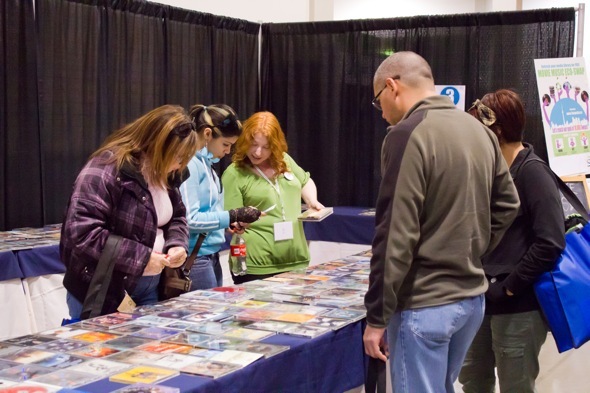 At the show, they've organized a media swap — the idea is you bring along your previously loved DVDs, CDs, BlueRays, and Records. For each accepted item, you get a token to select and take a new-to-you item home. I only wish this booth had been better advertised in advance, as I would have brought a bunch of used DVDs I no longer watch along with me. 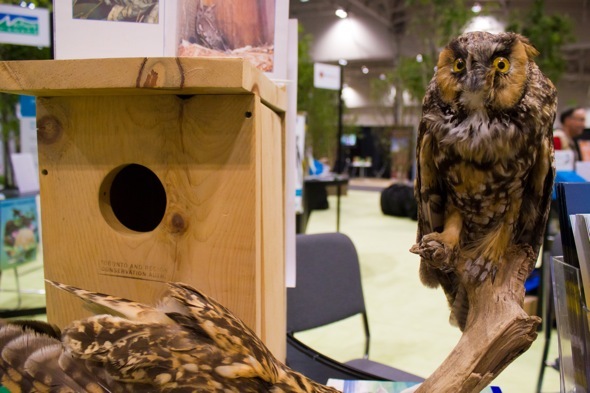 A joint exhibit between a number of nature, bird, and conservation areas, including the Toronto and Region Conservation Authority, Birds in Your Backyard offers visitors a wealth of information about, well, the birds you see around your area. What really caught my attention here, however, was the live bird demonstrations. Running every hour between 11 a.m. and 5 p.m., you can catch bird wranglers walking the floor with a variety of live birds to get up-close-and-personal with, including kestrels, hawks, and the Great Horned Owl. 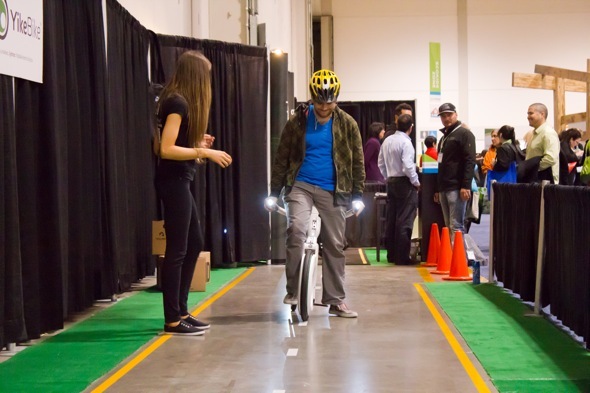 The Green Living Show takes place at the Direct Energy Centre, Exhibition Place from April 13-15 (Sat. 10-9 p.m., Sun. 10-6 p.m.) Admission is $15 for adults.